10 miles outside Del Rio on HWY 90 West. Turn left on spur 349. Go over the overpass, up to the port of entry. 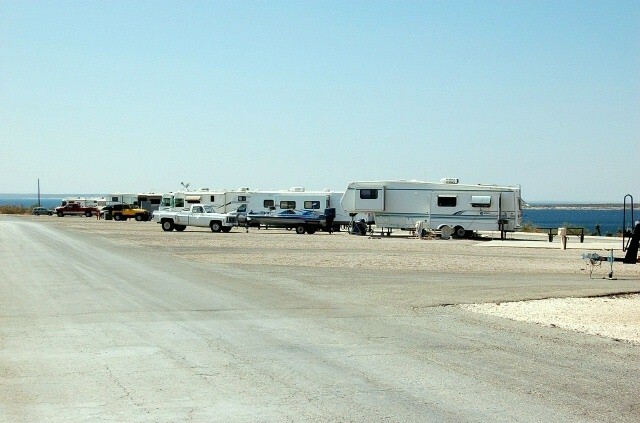 Take the second right (next to the port of entry) and drive down the blacktop road until you reach southwinds marina. Active, National Guard, Reservists, Retired, 100% DAV. DoD Civilians, Civilians that live or work at Laughlin AFB. Reservations have a 24 hour cancellation policy (there are exceptions for medical emergencies) Active Duty can reserve up to eight weeks in advance Retirees can reserve up to six weeks in advance Civilian CAC card holders and 100% disabled veterans can reserve up to three weeks in advance Must present a valid military ID. None at campground. WiFi is available at the office. Must use the local post office. Allowed with usual leash and clean-up rules. Pets may not be unattended for more than 4 hrs. There is one pet friendly cabin available. There is a $10 nightly fee for pets (cats and dogs only). Pet owners need the pets shot records. 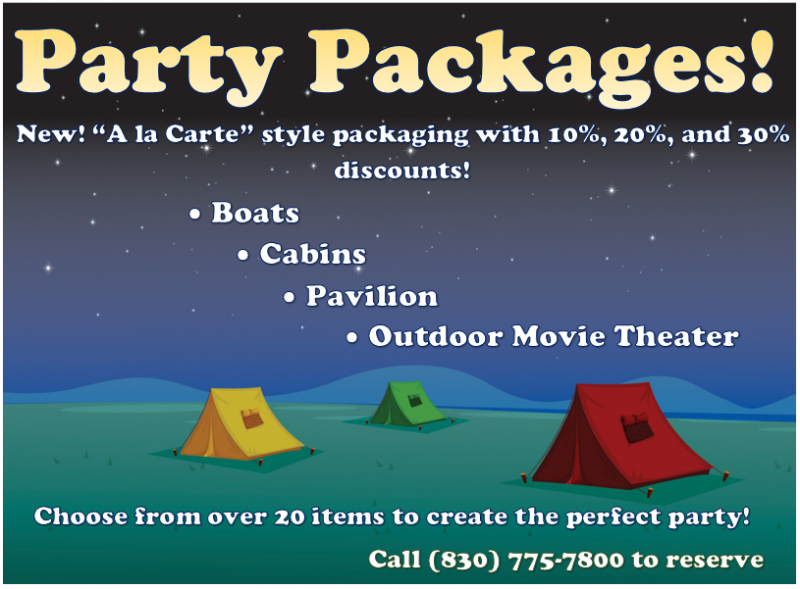 Bring your own linens, bedding, etc for cabin and trailer rentals. 30 day stay limit in the cabins. 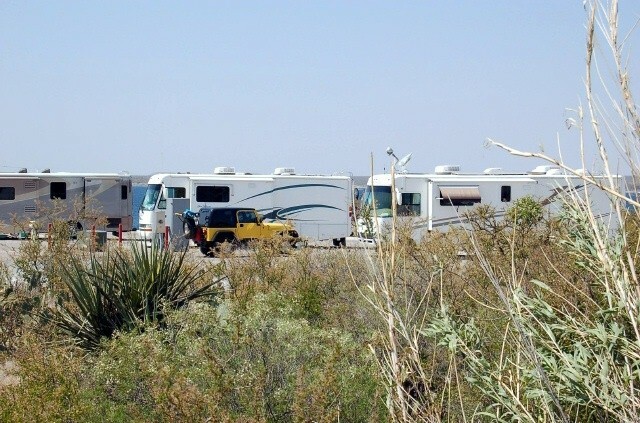 10 RV sites can be rented up to 180 days, 5 RV sites can be rented for 30 day limit (can be extended to 90 days), and 5 RV sites have a week stay limit. 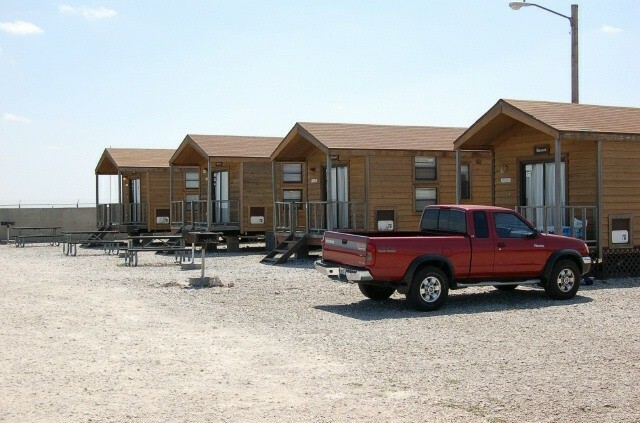 We are right on the lake and offer lodging in cabins, trailers, RV pads with full hook ups and basic sites, tent camping, and wet slips for boat storage. 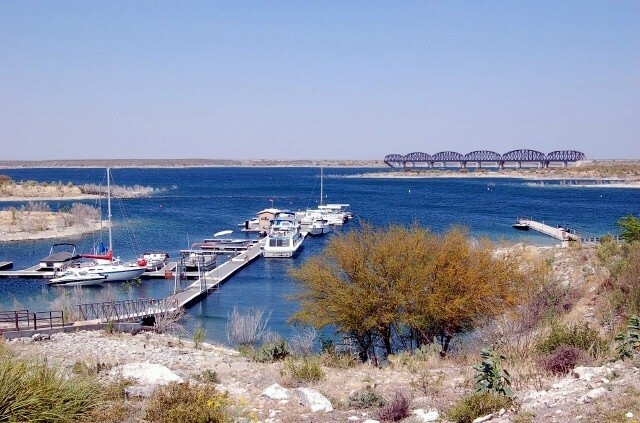 The Laughlin AFB Outdoor Recreation Area and boat ramp, collectively named Southwinds Marina, are located on Lake Amistad, one of the larger, clearer lakes in Texas. 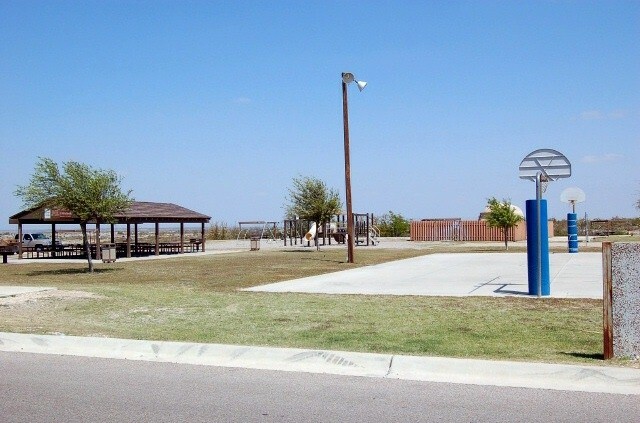 The recreation area is located off of Highway 90 West and Spur 349. Southwinds Marina offers a variety of outdoor activities. The marina rental facility has reasonably priced boat rentals. 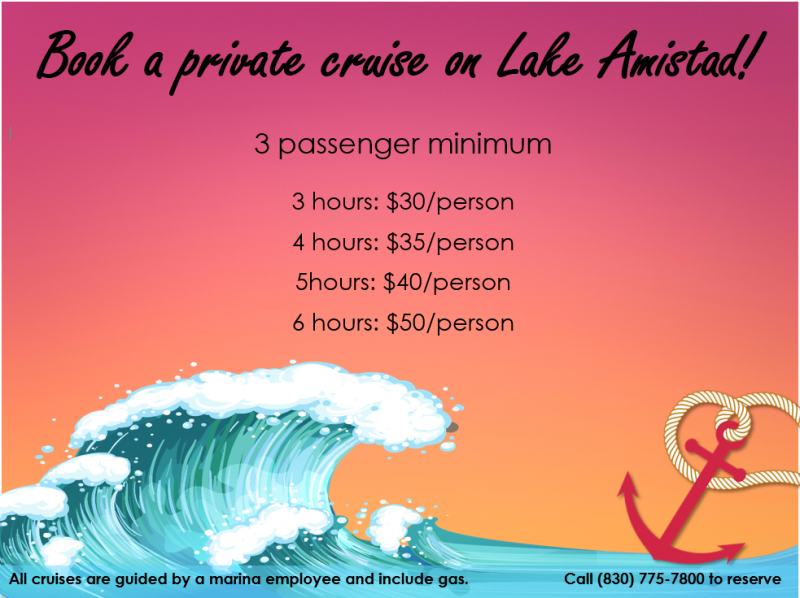 Rentals include fishing boats, bass boats, pontoon boats, ski boats, and deck boats. We stayed a month. How could you get tired of the view? Endless sky and a different sunset every night. It was very peaceful. You have the low moan of the train now and again but it was interesting to watch it cross the bridge. There are roads to hike or drive if you have a 4x4 truck. The flowering trees and grasses of spring added a delicious smell to the air. The bathrooms were ok. Not the worst and the water was hot. 1-5 elec/water and smaller sites. I wouldn't park more than a 30ft there. 6-20 in a straight line full hookup and spacious! No fire pits, but a nice grill. Do not use your awning! Breezy to very gusty most days. Just park close enough to the shelter. Maintenance very friendly and helpful. We had a great time and would definitely come back. We tent camped on an rv site #2. A partial hook up...power water...no sewer. The men's room was not even useable. The urinal was holding a black sludge, the trash overflowing, trash in the stalls on the floor...and it was never cleaned the 3 days we were there. The primitive tent sites had weeds on the pads, were overgrown all around the pads just overall unkept. The "store" was never open the entire time we were there...though the hours were posted to be open. The front sitting area of the store had bird droppings all over the tables, spider webs all over the entire area, totally unkept. Spilled over trash right at the door, the BBQ grill had not been cleaned in a very long time. The "cleaning" supplies were hanging outside over the rail along with other just thrown out items...just a real mess. We never saw any indication of a camp host, other than a vehicle parked by an rv which had an air conditioner running inside. The entire property is unkept. It is a shame because it has great potential. Someone is not doing their job. Or really, a lot of people are not doing their job. 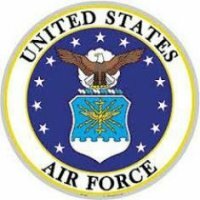 Shame on the Air Force for not having more pride in their facilities, and not holding people accountable...and still getting paid for a job not being done. Good location for us to visit Amistead National Recreation Area. Weather was surprisingly cool, cloudy, and occasional sprinkles so never took advantage of kayak or boat rental. We were in site 5 with 50 amp and water, no sewer. Okay by us because we would use the dump station on our way out. WRONG! Dump station was worst we have ever seen for a military campground. Approach around back of laundry was broken concrete with large potholes. Dump area was narrow with curbs on both sides. Open pvc drain with no cover and no water. We elected to pull thru an empty site and use the sewer connection there. Checked out the bathrooms and showers. Very dirty. Surprisingly the laundry was very good. New washers and dryers, free, and the room was quite clean. Trash can was full, obviously hadn't been emptied in a while. Homemade trailer still in a site but no sign of occupant. We liked the back-in electric/water only sites better than FHU as we had a nice grassy area and more space between our neighbors. We were here over Easter weekend so there were lots of young families and children. No problems and everyone seemed to have a good time. Very nice playground for children. We would stay here again if in the area. Well, some things never change and probably won't. Homemade trailer still there going on 3 years, even with change in long term policy at both marina and Lauglin, told it's 90 days out for 24 hours, then return for another 90 with no waivers. New Force Support Chief has taken over and new manager is supposed to start on Jan 9. Sites 11-20 full hook up are now basically long term and were all occupied, fairly clean around sites, except for one or two. One site is taken by maint man. I would recommend calling for a reservation before driving out, there were electric and water sites available and only 2 full hook ups available during the week of Christmas. Laughlin had 4 sites available over the weekend before Christmas when we drove through, they were the first come first serve sites and had none of the receivables available. Has improved some from last year but still could use some work. Hanna has done a fairly good job for being thrown into the weeds. We stayed for a week then moved into town to Broke Mill which is a lot nicer and has a lot more to offer than the marina or Laughlin, and only $8 more a day more on the daily rate or weekly rate. It was still a peaceful and nice stay, but with price increase I don't think it's worth it since we don't fish. As others have stated, it's not very clean or cared for. I don't need the facilities and can't speak to their condition. It's quite warm today and I've counted four dogs either tied out or in kennels outside, three of them in the homemade trailer at the far end of the campsite. Judged on the droppings, some owners are inconsiderate and leave pet waste where it's deposited. Fortunately, this place is not the norm and I only have to stay one night. There are 15 pull thru FHU RV sites 20/30/50 and 5 back in 20/30/50 and water sites. Bathrooms could use a good cleaning but not totally bad. Marina office/store is CLOSED on Mon, Tue, Wed and open 9-3 the other days in winter, it has very small selection of drinks and snacks,plenty of rental equipment available although it was cold while we were here. Campground Host is on site 6, but you won't see much of him and not sure he knows whats going on. At least two sites are homesteading and trashy looking, one site has a FEMA rental trailer on it. 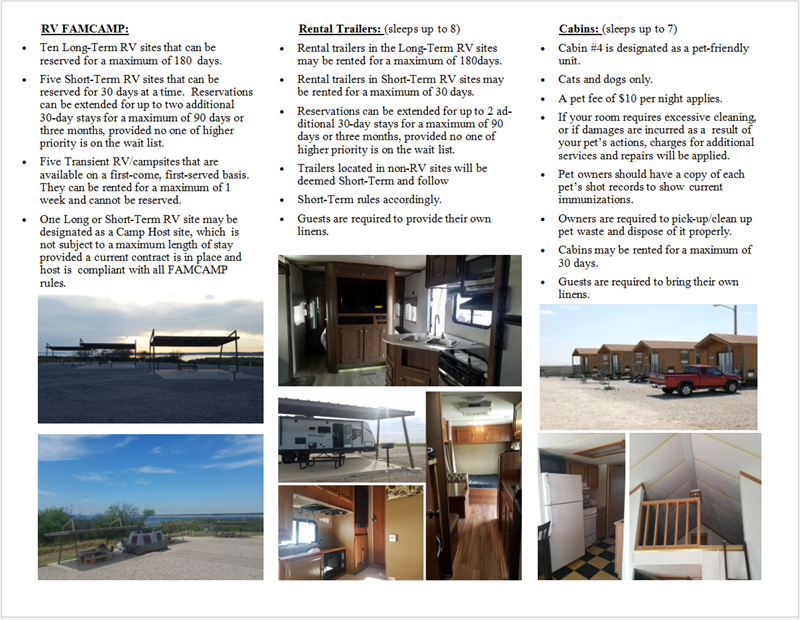 They do have 4 or 5 park models for rent in seperate area as well as two additional FEMA trailers. It is apparent that this park has been ignored for a few years and could use some work and clean up. However it was still a relaxing place to stay and we would return. I did complain to the staff about the junkie looking trailers and the lack of attention being paid to the restrooms. 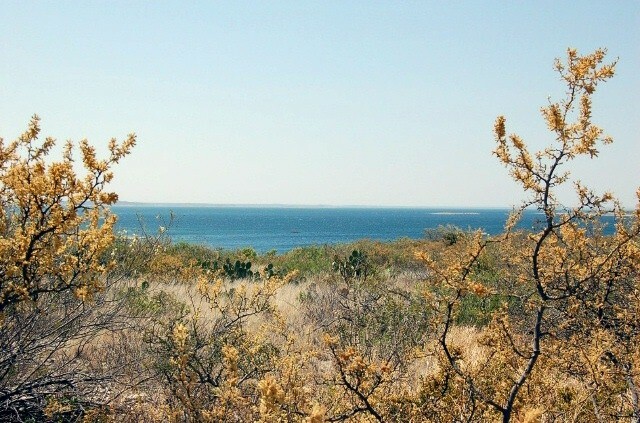 Del Rio is 8 miles away and has about everything you would need. The base is about 15 miles away. Directions above are good. Just keep driving til you get to the Border Patrol Entry Station and stay to right (don't enter border crossing) you'll turn right just after and across from Entry Station onto the Marina Rd, 1.8 miles and it ends at the Marina/Campground. GPS had me turn before crossing RR, DON'T stay on 349 to border station about 2 miles. I am told the manager has been in the position for about 2 years, the Marina employee has just started working out here recently and is trying to clean things up, and the Wing Commander has taken an interest in the marina and making it better, time will tell. It appears that there is a lack of Management oversight at this place. We stopped for one night on way from Carlsbad Caverns to San Antonio. Watch the directions carefully and follow the signs or you might end up in Mexico where the dam is. Marina was open for check-in. We kayaked for about 3 hours from the boat ramp. Large metal patio cover to help with the sun. Gorgeous sunsets. Wish all campers would keep their sites clean. We stayed here 6-15 April 2015. Overall it was a very nice place to stay. The campground is located high above the now receding water line, but it provides some very nice sunsets. There are a lot of nature trails provided by the National Park Service in the area. The town of Del Rio provided all the supplies we needed, with a few nice restaurants. On the way to visiting the Judge Roy Bean courthouse and home, you will pass over the Pecos River. Stop on the bridge for some magnificent views. Stop by the J&P Bar and Grill in Comstock, TX. We had the best hamburgers ever. We had reservations and arrived on a Monday. The Marina was closed. It is open only on Thursday to Sunday. We found the camp host and he told us what slot to go in. That was about the last time we saw the camp host. We caught up with the Marina personnel when they were open. Watch for the deer when you walk the trails and you may catch a glimpse of an albino deer. Texas offers a free hunting/fishing combination license for disabled veterans. Take your annual letter from the VA to Walmart and they will issue you a license. Also, the National Park Service offers an "Access Pass" to disabled veterans. Use that to access the park, although there were no checkpoints. Over all it was a very relaxing and inexpensive place to stay. We did not use the Marina, Restrooms, or the playground, but they were available. This is a most awe inspiring place to camp. 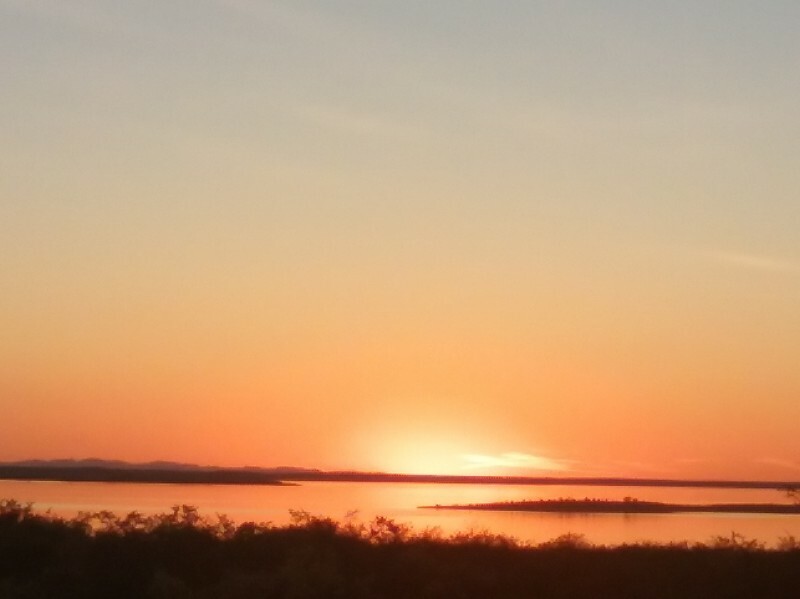 Coming from northern Minnesota to Lake Amistad was like in another world. The views and sunset were magnificent. The campsite was nice. Very quiet during the winter months. I could not imagine how it would be I the summer. A true hidden gem. We stayed at Laughlin for 1 night. Won't do that again. FamCamp is located to close to the flight line. Noisy and all you can smell is jet fumes. 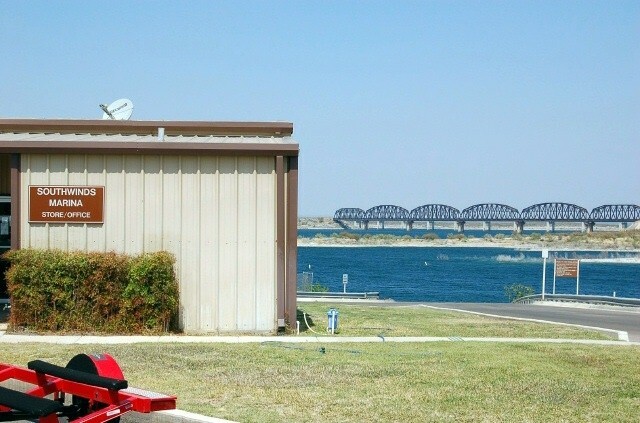 If you come to Del Rio, you have to stay at Southwinds Marina. A little TLC in area in front of the RV park and general area would be a great improvement. The area looks like a catch all dumping area. Campers don't need to look at that. Overall we enjoyed our stay very much. Would return again and again. Very disappointed in way patrons are treated. Embarrassed that guests saw and tried to use a MWR facility in such poor shape. Bedding in the cabin was so horrible we had to lay the vinyl sleeping pads on the floor to get enough support to sleep. The couch (pull out bed) was so worn you could not sit on it without feeling the metal frame underneath. The majority of the boat trailer parking was reserved for employee parking instead of guests. An overflow area was established further up the hill in the brush with weeds all over the parking pad. No employees were seen using the reserved spots. After hour patrons were being allowed to park on boat ramp causing boaters to have to use the top of a very long hill to turn around to back trailer on boat ramp. The marina docks were not secured and were allowed to drift in cove sometimes blocking entrance/exit to the cove for the boats. Rental boats were moored without and type of bumpers and allowed to shift in slip causing major damage to metal sides. The main dock was so full of paddle style boats no boat parking for patrons was available to launch or recover boats. The retail store was only seen open one time during our stay and the items for sale were only water and some small sodas. Retail store hours were posted at 9am to 3 pm. This is a weekend summer facility that offers patrons nothing. Rates were advertised at $35 a night but I was charged $40 per night. MWR is losing a vast revenue in the retail store, boat rentals and camping essentials by not serving the patrons. I felt like boaters were second class citizens at this facility. I WILL NOT use this facility again nor will I recommend to others. A great overnight near Del Rio. The campground itself is pretty desolate, but the pull-through site on cement with 50 amp and full hookups for $10 cannot be beat. Pleasant staff. It would have been helpful if the way to the office had been marked; when you enter the park, turn right, in front of the cottages and continue straight to the beige building near the water. Good ATT aircard signal. I really enjoyed my stay here it is very quiet and peaceful. 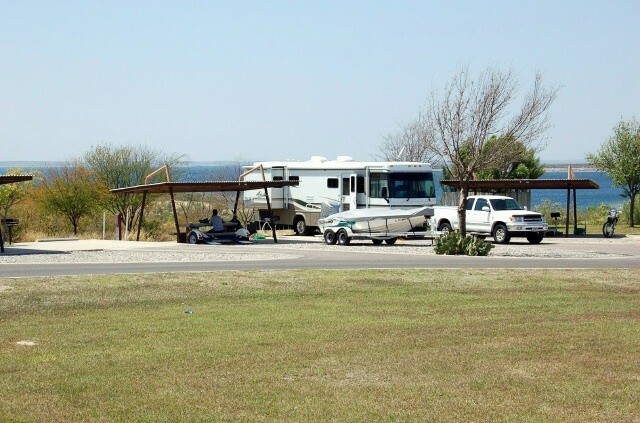 You have a beautiful view of the lake, and the campsites are level, with covered patio's and grills. As for the laundry, they have placed 2 stackable units that are unsat for the number of full timers in the park. (Just to small). 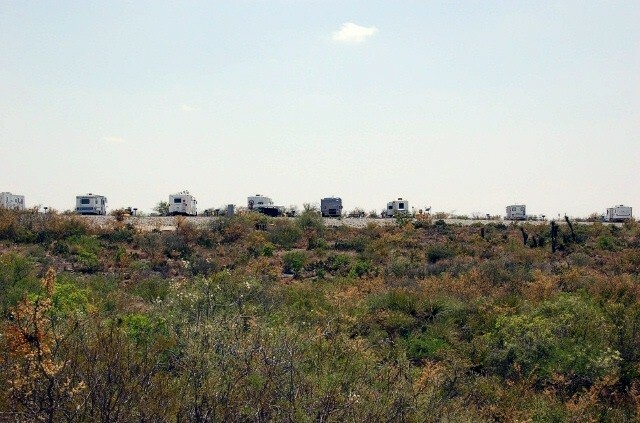 Any supplies you may need means a trip to Del Rio, about 10 miles down the road. Had a few days of the dreaded Texas wind blowing, but had plenty of days to hike the shoreline, watching the deers and other critters. This is a great place to enjoy the quiet. Sprint Broadband card users, excellent 3G signal for internet access. Will come back! I love the place i don't know why people post up bad reviews of the place. Everything is kept clean and maintenance does a great job around here. The manager is a good guy and the camp hosts are very friendly to everyone. If there is ever anything you need ask for Lyle he works here and is the best help you can find. The boats are in real good conditions and are very affordable fishing is great here everyone should try. I stayed at one of the cabins and they are really nice. They got a fridge microwave showers dining table kitchen utensils pans and a nice master bedroom. The only thing I had to bring was my linen and dish soap to clean up after. Has a basketball court volleyball court and a pavilion to have parties or barbecues. They provide free washers dryers and showers. You have a beautiful view of the lake. Staff is very helpful and the camp hosts are superb. You have free washers and dryers. The grounds are well kept. Walmart super center is only 8 miles from the Marina. Boats are available for rent and the fishing is great. CHECK IT OUT!!!!!! 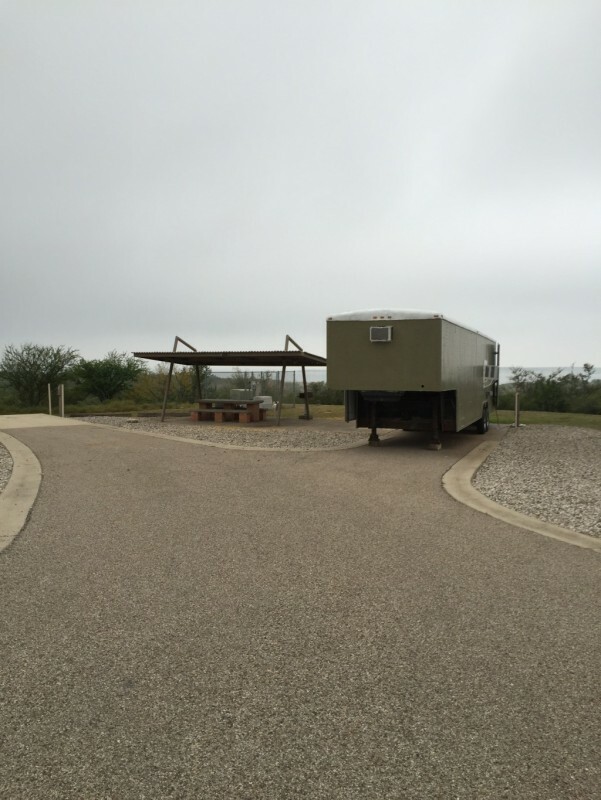 On a weekday in the winter, the Lake Amistad campground (and the lake itself) is very quiet and peaceful. The campsites are level, with concrete pads. In the lower five back-in sites (where we stayed), the water hookup is on the "wrong" side of the pad, but still close enough for a normal 25 foot hookup hose. The bath house is clean and adequate. The toilet part is open, but the showers are behind a cypher locked door, the combination for which is available at the office or from the camp host when you check in. The laundry has a different combination for its door. As for the laundry, the machines are old and beat-up and leaky. Another reviewer below mentioned the leaks, but a woman in the laundry room (apparently a long-time regular here) said that they've been leaky for years. The whole laundry could use some new equipment and maintenance. 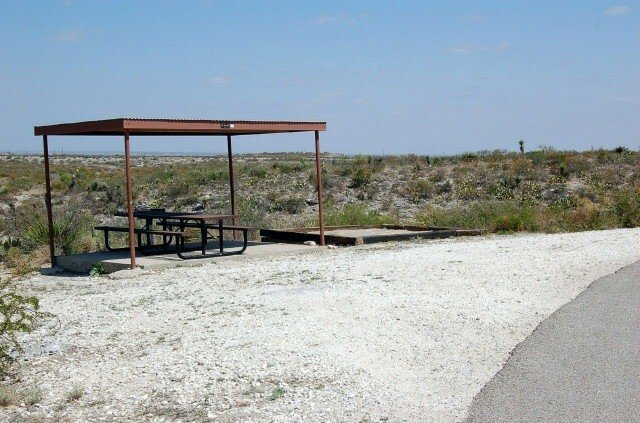 There are a few minor snack items and bagged ice for sale at the office, but if you need to do any serious resupply, you'll have to go to Del Rio, Texas about 10 miles down the road. The rental boats are engine-powered only...no canoes or kayaks. The cheapest one is $13.50 per HOUR. Happily for us, the dreaded Texas wind wasn't blowing, so we spent a pleasant afternoon hiking the shoreline, watching and photographing the abundant wildlife, the sunset, and generally enjoying ourselves. With the mild winter weather, this is a great place to spend some time (but then we like the quiet and the critters). For Sprint Broadband card users, we had excellent 3G EVDO signal for internet access. This campground is isolated. 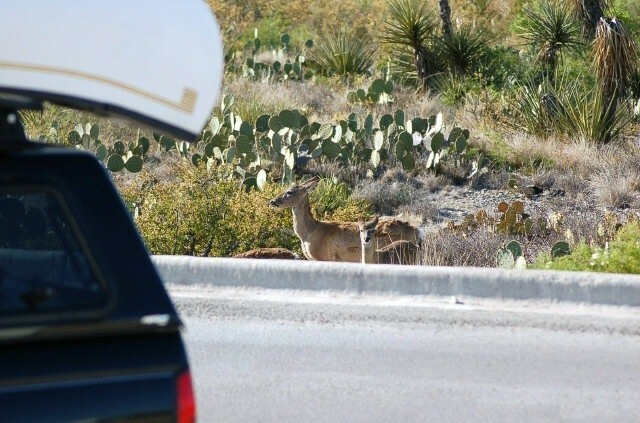 There is nothing around it unless you drive to Del Rio, about 15 miles. 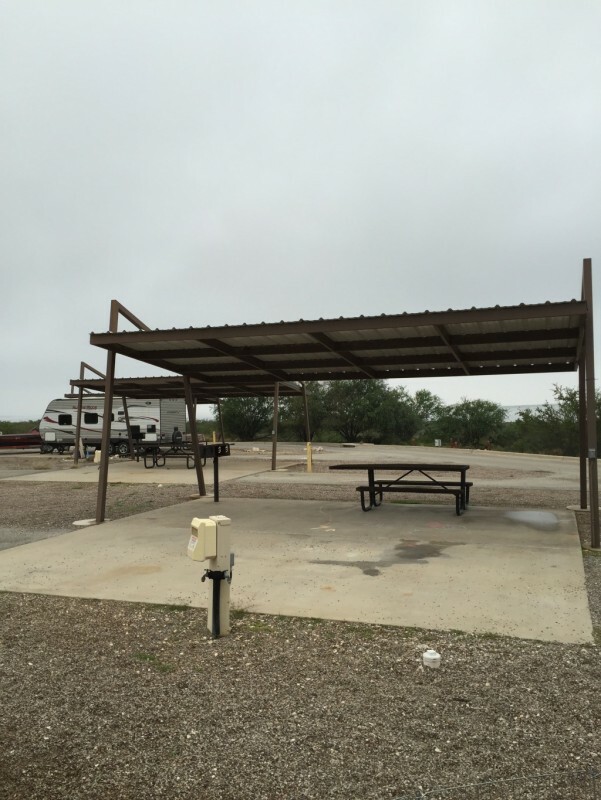 Each site does have a level, concrete pad, a picnic table and grill. Area over table and grill is covered which probably is great in the summer. From looking around and reading, it would be a great place if you were into fishing. It was always windy while I was there. The laundry is free and consists of two washers and two dryers. Both washers leaked all over the floor and the drain did not handle it all that well. Some of the water was running out the door. One of dryers broke down while I was there. A repair man came the last day I was there and said they had to order a part to fix it. I removed clothes from the one working dryer (which is a no-no according to a post).. It had children's clothes in it and I had not seen children in days. I did 5 loads of laundry and still no one came to claim the clothes. Overall, it is not a bad place, but not a great place for an extended visit unless you are just looking for a place to park your rig and be alone. The camp host was there to greet me the first night I pulled in and said I was not on the board with a reservation. After the office opened the next day, I was on the board. Host said he would be back with combo to laundry and showers, I never saw him again. L.H. left this review using the Directory software: Previous comments pretty much cover it. Easy in & out. Camp hosts very friendly & helpful. Quiet, peaceful during the week. More traffic on weekends. The speed bumps keep most of the traffic slow. Winds more a breeze most of my stay. A nice, relaxed environment. Water activities available. Other activities not so much. Del Rio with WalMart, Home Depot, shops & stores about 12 miles south on great roads. 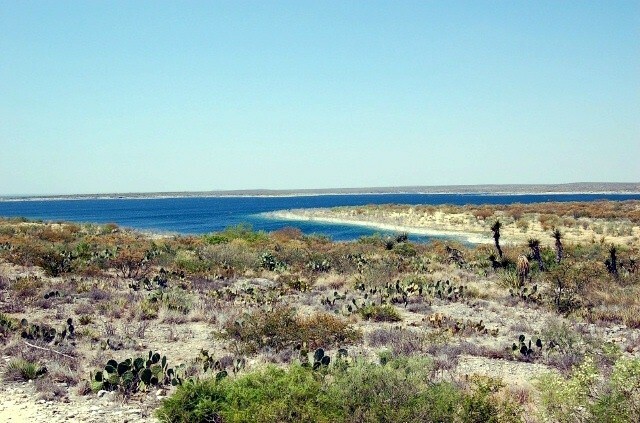 Lake (reservoir) Amistad is jointly owned by US & Mexico. The middle of the dam is the border. 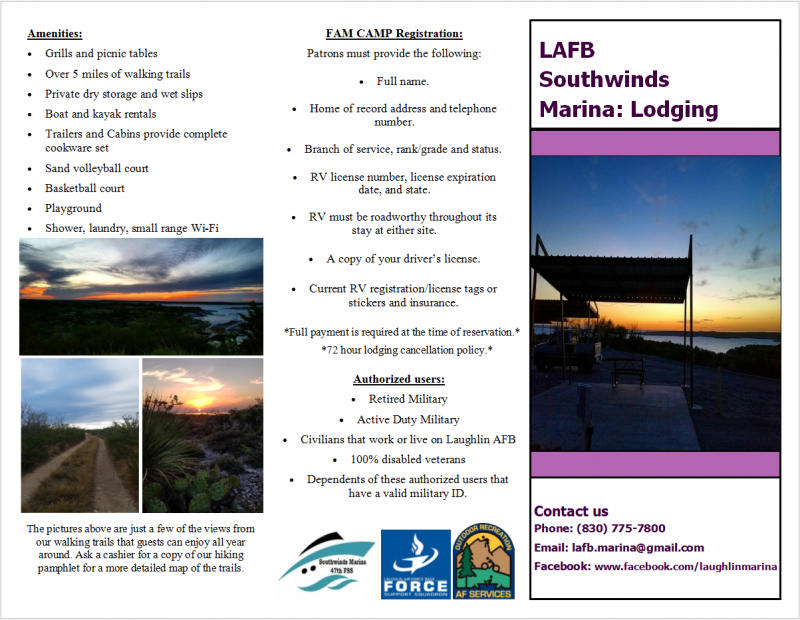 Side note: I have stayed at 3 famcamps in the last few months and mil permanent party/DOD/border patrol are being allowed on more sites for extended stay. Maybe a trend? Do not seem to care much for overnighters. You have to be staying for a minimum of three nights or the don't want to give you the door code for the laundry (free) or the showers?????? Concrete pads at each site, metal roofed patios at each site. High up overlooking the reservoir. 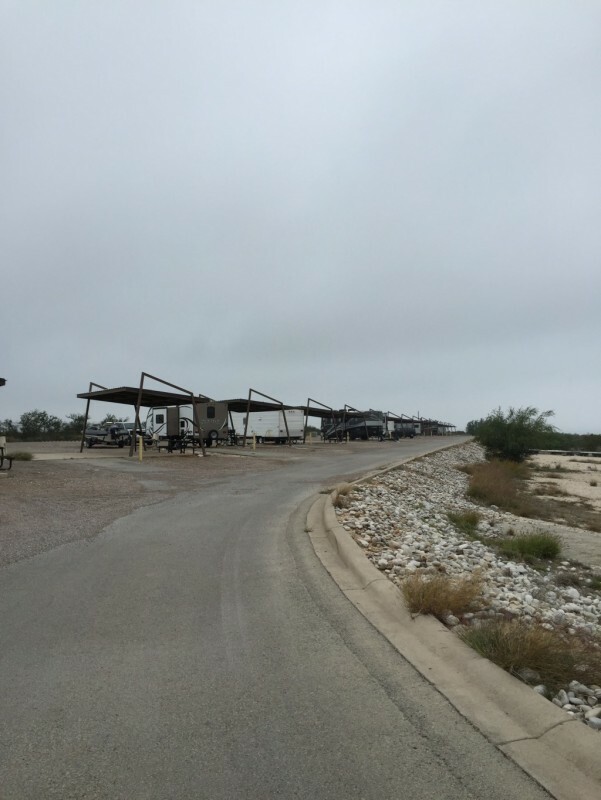 Like most military campgrounds, it started out looking nice and everything planned for, then with use it starts getting seedy from poor maintenance. If you are a fisherman and want to pursue that, this is the place. We loved it here. The sunsets over the water are spectacular and seem to go on forever. We had some wind the second day along with rain that night but we expected it as a front approached. The sites were clean and the host very friendly and helpful. The store was closed all but the last day we were there so I can't speak to that. The facilities were very clean as were the grounds. The new canopies over the picnic tables were extremely nice. We are already planning on taking our boat back for a week sometime soon. The lake was full (about a foot over normal pool elevation). We loved the laid back atmosphere and the concrete pads, cable tv and wifi made our stay a good one. Lots of walking areas and little trails to go down by the water. Arrived here on December 10th. Mark and Reggi, the campground hosts helped us get situated in one of the full-hookup sites. After parking and setting up, my wife went down to the office to pay. The manager almost bit her head off when she asked if the park accepted any discounts. We thought that he may have been having a bad day but quickly found out that is his normal demeanor and not to pay attention to him. This park is just OK. There are 5 old FEMA trailers parked in some of the full-hookup sites which are an eye-sore and take up valuable spaces that could be rented to RV'ers. We learned that the trailers had been bought for a song and put here to rent to fisherman. We have been here almost 3 weeks now and have not seen anyone stay in one of them. We also were told that the formaldehyde smell in them is really bad. The wind here is very strong at times. During our stay it blew several days at above 35 MPH and on some days it got to above 50. We had to pull in our slides several times to protect the awnings and to prevent the trailer from bouncing too much. 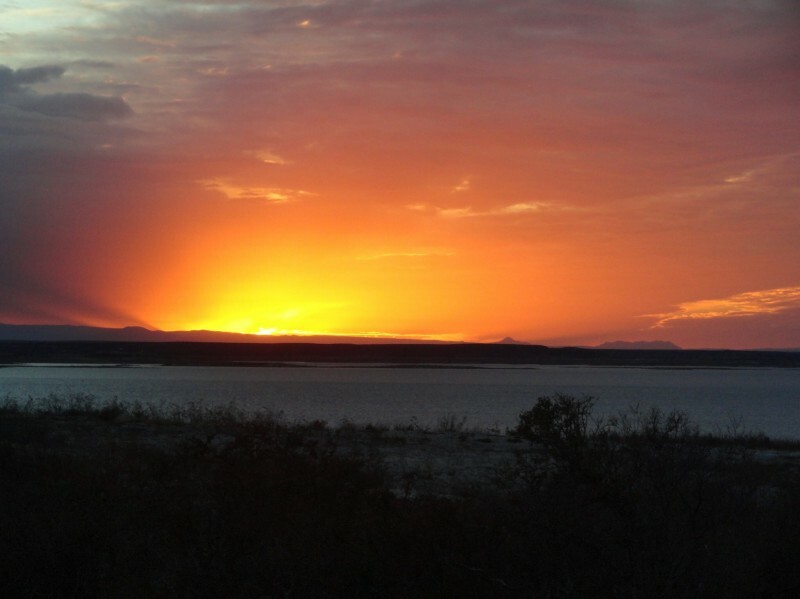 If you are planning a visit, be aware that the wind can come up here anytime and the forecast speeds for Del Rio don't apply to Lake Amistad. The older sites that don't have sewer hookups are somewhat protected but not by much. The laundry is free and very well kept. Restrooms were clean. The full-hookups sites have 50 amp service but the power does surge. Our Verizon wireless was in Extended Network mode so the USB720 air card was roaming and sloooow. Would I stay here again? Maybe, but not for an extended stay. Too windy for our taste.